A simple curry loved by all who ate. Slit brinjals by keeping the top intact and keep in water. Heat oil and add onion. Saute till it becomes lightly brown. 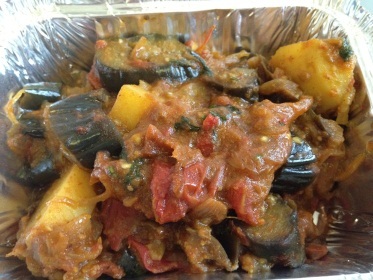 Add brinjals pieces, potato and tomato. Add ½ cup water and add salt. Cover with a lid and cook till done. Stir carefully so that the brinjals retain the shape. The water would have evaporated completely and the curry will get a dark brown colour. Adjust salt and take off fire. Sprinkle coriander leaves ad mix. This is best served with chapathis.